and is achieved through abstract classes. Encapsulation is a strategy used as part of abstraction. Encapsulation refers to the state of objects - objects encapsulate their state and hide it from the outside; outside users of the class interact with it through its methods, but cannot access the classes state directly. So the class abstracts away the implementation details related to its state. Abstraction is the process of refining away all the unneeded/unimportant attributes of an object and keep only the characteristics best suitable for your domain. Now I m messed up with the whole concept. I know about abstract class, inheritance, access specifiers and all. I just want to know how should I answer when I am asked about abstraction and/or encapsulation in an interview. keep in mind that by simply hiding all you class members 1:1 behind properties is not encapsulation at all. encapsulation is all about protecting invariants and hiding of implementation details. here a good article about that. http://blog.ploeh.dk/2012/11/27/Encapsulationofproperties/ also take a look at the articles linked in that article. classes, properties and access modifiers are tools to provide encapsulation in c#. you do encapsulation in order to reduce complexity. Yes, that is a good definition for abstraction. They are different concepts. Abstraction is the process of refining away all the unneeded/unimportant attributes of an object and keep only the characteristics best suitable for your domain. Yes, they are different concepts. keep in mind that abstraction is actually the opposite of making an object suitable for YOUR domain ONLY. it is in order to make the object suitable for the domain in general! if you have a actual problem and provide a specific solution, you can use abstraction to formalize a more generic solution that can also solve more problems that have the same common pattern. that way you can increase the re-usability for your components or use components made by other programmers that are made for the same domain, or even for different domains. good examples are classes provided by the .net framework, for example list or collection. these are very abstract classes that you can use almost everywhere and in a lot of domains. Imagine if .net only implemented a EmployeeList class and a CompanyList that could only hold a list of employees and companies with specific properties. such classes would be useless in a lot of cases. and what a pain would it be if you had to re-implement the whole functionality for a CarList for example. So the "List" is ABSTRACTED away from Employee, Company and Car. The List by itself is an abstract concept that can be implemented by its own class. Interfaces, abstract classes or inheritance and polymorphism are tools to provide abstraction in c#. you do abstraction in order to provide reusability. Encapsulation: hiding data using getters and setters etc. Abstraction: hiding implementation using abstract classes and interfaces etc. Abstraction: is outlined by the top left and top right images of the cat. The surgeon and the old lady designed (or visualized) the animal differently. In the same way, you would put different features in the Cat class, depending upon the need of the application. 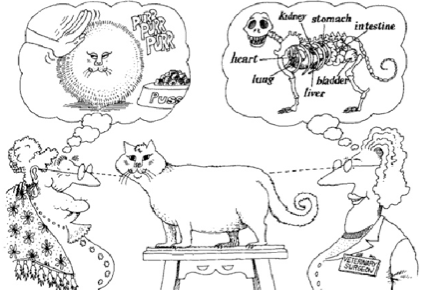 Every cat has a liver, bladder, heart and lung, but if you need your cat to 'purr' only, you will abstract your application's cat to the design on top-left rather than the top-right. Encapsulation: is outlined by the cat standing on the table. That's what everyone outside the cat should see the cat as. They need not worry whether the actual implementation of the cat is the top-left one or the top-right one or even a combination of both. PS: Go here on this same question to hear the complete story. I will try to demonstrate Encapsulation and Abstraction in a simple way.. Lets see.. Hiding Unnecessary Data and Functions from End User. The below Image shows a GUI of "Customer Details to be ADD-ed into a Database". By looking at the Image we can say that we need a Customer Class. Step - 1: What does my Customer Class needs? 2 variables to store Customer Code and Customer Name. 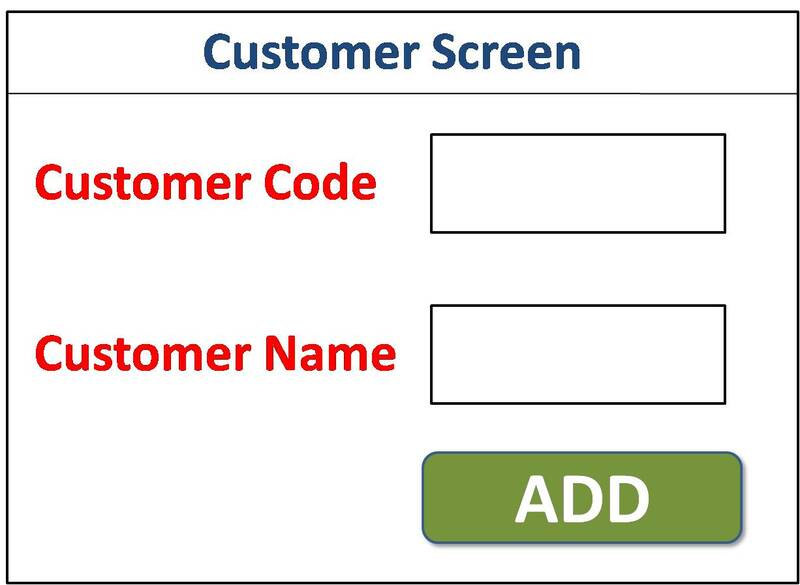 1 Function to Add the Customer Code and Customer Name into Database. Now only ADD method wont work here alone. Step -2: How will the validation work, ADD Function act? We will need Database Connection code and Validation Code (Extra Methods). Now there is no need of showing the Extra Methods(Validate(); CreateDBObject() [Complicated and Extra method] ) to the End User.End user only needs to see and know about Customer Code, Customer Name and ADD button which will ADD the record.. End User doesn't care about HOW it will ADD the Data to Database?. Step -3: Private the extra and complicated methods which doesn't involves End User's Interaction. So making those Complicated and Extra method as Private instead Public(i.e Hiding those methods) and deleting the obj.Validate(); obj.CreateDBObject(); from main in class Program we achieve Encapsulation. In other words Simplifying Interface to End User is Encapsulation. Step -1: What does my Customer Class needs? is Abstraction. Step -3: Step -3: Private the extra and complicated methods which doesn't involves End User's Interaction is Encapsulation. P.S. - The code above is hard and fast. I think they are slightly different concepts, but often they are applied together. Encapsulation is a technique for hiding implementation details from the caller, whereas abstraction is more a design philosophy involving creating objects that are analogous to familiar objects/processes, to aid understanding. Encapsulation is just one of many techniques that can be used to create an abstraction. For example, take "windows". They are not really windows in the traditional sense, they are just graphical squares on the screen. But it's useful to think of them as windows. That's an abstraction. If the "windows API" hides the details of how the text or graphics is physically rendered within the boundaries of a window, that's encapsulation. Abstraction: means that you only incorporate those features of an entity which are required in your design. So, if every bank account has an opening date but your application doesn't need to know an account's opening date, then you simply don't add the OpeningDate field in your Object-Oriented Design of the BankAccount class. †Abstraction in OOAD has nothing to do with abstract classes in programming. By this principle, your entities are a abstraction of what they actually are. You design an abstraction of Bank Account down to only that level of detail that your application's needs. Inheritance: is more like a trick than an actual principle, which saves you from re-writing those functionalities that you have written somewhere else. The only thing is that there has to be a relation between the new code you are writing and the old code you are wanting to re-use. Just like you may inherit your parents' wealth, you may inherit fields and methods from your parent class. So, taking everything that parent class has and then adding something more if need be, is inheritance. Don't go looking for inheritance in your Object Oriented Design. Inheritance will present itself. Polymorphism: is a consequence of inheritance. Inheriting a method from the parent is useful, but being able to modify a method if the situation demands, is polymorphism. You may implement a method in the subclass with exactly the same signature as in parent class so that when called, the method from child class is executed. This is the polymorphism. not all the pieces of data and methods may be public. Another simplified answer is here. † People who argue that "Abstraction of OOAD results in the abstract keyword of OOP"... Well that is simply not correct. Example: When you design a University in an application using object oriented principles, you only design an "abstraction" of the university. Even though there is usually one cash dispensing ATM in almost every university, you may not incorporate that fact if it's not needed for your application. And now though you have designed only an abstraction of the university, you are not required to put abstract in your class declaration. Your abstract design of university will be a normal class in your application. the purpose of encapsulation is to hide implementation details from the user of your class e.g. if you internally keep a std::list of items in your class and then decide that a std::vector would be more effective you can change this without the user caring. That said, the way you interact with the either stl container is thanks to abstraction, both the list and the vector can for instance be traversed in the same way using similar methods (iterators). One example has always been brought up to me in the context of abstraction; the automatic vs. manual transmission on cars. The manual transmission hides some of the workings of changing gears, but you still have to clutch and shift as a driver. Automatic transmission encapsulates all the details of changing gears, i.e. hides it from you, and it is therefore a higher abstraction of the process of changing gears. Encapsulation: Hiding implementation details (NOTE: data AND/OR methods) such that only what is sensibly readable/writable/usable by externals is accessible to them, everything else is "untouchable" directly. Abstraction: This sometimes refers specifically to a type that cannot be instantiated and which provides a template for other types that can be, usually via subclassing. More generally "abstraction" refers to making/having something that is less detailed, less specific, less granular. There is some similarity, overlap between the concepts but the best way to remember it is like this: Encapsulation is more about hiding the details, whereas abstraction is more about generalizing the details. Your client doesn't know anything about Id and Name in this function. Now if, your client wants to know the last name as well without disturbing the function call. You do encapsulation by adding one more property into Person class like this. Look, even after addding an extra property in class, your client doesn't know what you did to your code. This is where you did abstraction. As I knowit, encapsulation is hiding data of classes in themselves, and only making it accessible via setters / getters, if they must be accessed from the outer world. Abstraction is the class design for itself. Means, how You create Your class tree, which methods are general ones, which are inherited, which can be overridden,which attributes are only on private level, or on protected, how Do You build up Your class inheritance tree, Do You use final classes, abtract classes, interface-implementation. Abstraction is more placed the oo-design phase, while encapsulation also enrolls into developmnent-phase. I think of it this way, encapsulation is hiding the way something gets done. This can be one or many actions. Abstraction is related to "why" I am encapsulating it the first place. I am basically telling the client "You don't need to know much about how I process the payment and calculate shipping, etc. I just want you to tell me you want to 'Checkout' and I will take care of the details for you." This way I have encapsulated the details by generalizing (abstracting) into the Checkout request. I really think that abstracting and encapsulation go together. In Java, abstraction means hiding the information to the real world. It establishes the contract between the party to tell about “what should we do to make use of the service”. Example, In API development, only abstracted information of the service has been revealed to the world rather the actual implementation. Interface in java can help achieve this concept very well. Interface provides contract between the parties, example, producer and consumer. Producer produces the goods without letting know the consumer how the product is being made. But, through interface, Producer let all consumer know what product can buy. With the help of abstraction, producer can markets the product to their consumers. Encapsulation is one level down of abstraction. Same product company try shielding information from each other production group. Example, if a company produce wine and chocolate, encapsulation helps shielding information how each product Is being made from each other. If I have individual package one for wine and another one for chocolate, and if all the classes are declared in the package as default access modifier, we are giving package level encapsulation for all classes. Not the answer you're looking for? Browse other questions tagged c# oop encapsulation abstraction or ask your own question. Is hiding implementation detail Encapsulation or Abstraction?